Tom: We spent our whole lives being good, right? And what has it gotten us? Nothing. So maybe this money is a gift to help us get our lives back on track. Anna: We don’t know where this comes from. This could be really, really bad money. Tom: I know, I know. But what makes money bad? Not the money. The people make it bad… What people do with it. There are two stories run side by side in the movie Good People. First one is the story of a couple who are struggling hard to see a better life when they have been served notice by the bank to pay the loan or vacate the house. The other story is about an old man, a police detective, and his wife who have recently lost their girl to drug abuse (the second one is only in the preface). Young American couple Tom and Anna (James Franco and Kate Hudson) have moved to London who are under the stress of huge debt while trying to renovating Anna’s family home in London. As the couple struggles to find a way for their dream home and start a family, they accidentally get hold of a huge amount of money from the house of their tenant who has been murdered. Although hesitant at first, their present situation lures them into hide the cash from the police and start using it whatever necessary to repay their debt. Unfortunately, a vicious gang of drug dealers want the money back, and when Tom and Anna start spending the money, they are bound to face bad things – often what happens with stupid people and not good people. Well, looking at the scenario, the act of the young couple can be dubbed as dumb and stupid, just as their logic of “people make the money bad.” Anyways, don’t know why James Franco does this kind of roles, where he looks very subdued without much acting skill on the floor. Although, Good People keeps you involved for a large portion of the film the presence of British actress Anna Friel and French actor Omar Sy (The Intouchables) can be best utilised in a more intensify script. Tom Wilkinson, on the other hand, is in his usual self and who has done many memorable films, including the Oscar-nominated In the Bedroom and Michael Clayton. P.S. 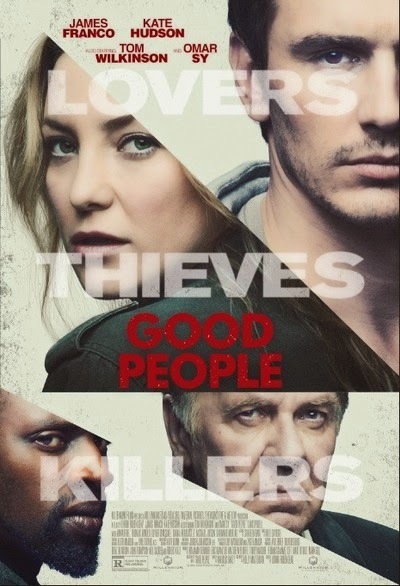 Good People is based on the novel by Marcus Sakey. And it is the first English film of the Oscar-nominated Danish director Henrik Genz (Terribly Happy).